1. Photo mode: hold maximum 3 bodies plus 5 lenses. 2. Video mode: hold a Canon C100 with handles and lens attached, microphone, 3 additional lenses and a backup body. 3.Drone mode: hold a DJI Phantom 4 drone with transmitter and a DSLR camera with 3 lenses. There are specific pockets for your 15" laptop. The front panel together with tuck away secure strap hold your tripod firmly on the bag. The punch through design will allow long tripod to sit on it firmly. Monopod or selfie pole can be attached to the side by the bungee cord. The specially designed harness system comes with side release buckles for swapping the positions. 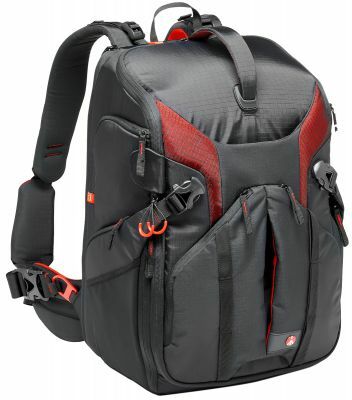 It can be configured into 3 different modes: a backpack, a sling or a cross backpack. 1. Backpack mode: maximum comfortability by distributing the load to 2 shoulders. 3. Cross backpack: combine the benefits of the above. Carry the pack by 2 shoulders while walking, release 1 of the shoulder strap and swing the pack to your front body for fast access. Waist belt keeps the pack close to your body and share some load as well. The bag comes with multi-purpose rain protector. Fold out the silver side to shield the pack from direct sunlight. Interchangeable Dividers: Both modular and easy to use, these dividers allow you to custom fit the inside of your bag around your gear by creating the exact size compartment for your gear. Tripod Connections: This bag comes with the option and proper connections to attach your tripod externally. Cabin Luggage: This bag fits the standard to fit as carry-on luggage (due to ever changing restrictions, check with your carrier prior to departure).